October features an interesting mix of films. There is something for every taste this month. Here are some of the more interesting or under-the-radar movies coming out in the next 30 days. Parkland (October 4th): Originally announced for September, "Parkland" was moved to October at some point. Everyone knows the story of JFK's assassination – or thinks they do – but "Parkland" focuses on the peripheral people involved that you don't hear much about: the doctors and nurses, cameraman, and others who were there that day and in the aftermath. It's a fresh angle on an incident that has already been dramatized countless times. Bad Milo (October 4th): A man's painful ulcer turns out to be a demon living inside his stomach. I'll just leave it at that, because no other words could possibly be necessary. The Dirties (October 4th): Kevin Smith "presents" this movie about school bullying, which means he didn't actually have anything to do with it – he just wants to endorse it, and he has, calling it "the most important film you will see all year." It definitely seems to have a homemade feel to it, which could add to the realism. It's about two bullied high school kids who decide to make a funny film about getting revenge on their classmates – until one of them wonders if they should shoot more than just a movie. Machete Kills (October 11th): The first "Machete" was a crazy grindhouse-style flick, with Danny Trejo as the titular character, Steven Seagal portraying a Mexican drug lord, and Robert De Niro hamming it up with a bad Texas accent. What?! But it was an undeniably fun time. Now, Machete is back to kill again – and along for the ride this time: Carlos Estevez (better known as Charlie Sheen) and Mel Gibson. The Fifth Estate (October 11th): It's probably too soon for any kind of serious film treatment of Wikileaks founder Julian Assange, but the combined acting power of Benedict Cumberbatch, Daniel Brühl, Anthony Mackie, Stanley Tucci, and Laura Linney is enticing. 12 Years a Slave (October 18th): I've known for years that Chiwetel Ejiofor is an amazing actor. Now it's time for the rest of the world to find that out too. I will openly admit that I'm rooting for him and his Oscar chances. He is someone who deserves the biggest opportunities possible. 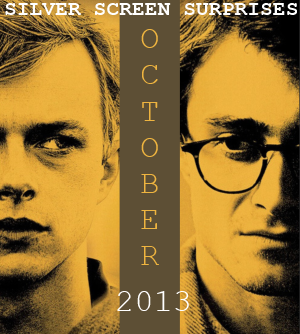 Kill Your Darlings (October 18th): "Harry Potter's" Daniel Radcliffe plays beat poet Allen Ginsberg. According to "Kill Your Darlings," a murder brought him, Jack Kerouac, and William Burroughs together. It's certainly an enticing hook – and so is seeing the former boy wizard in a more serious, grown-up role. In the Name Of (October 30th): Father Adam runs a center for boys in a small Polish village, where he happily plays soccer and preaches the good word. But why was he transferred from Warsaw? Is he hiding something? Accusations of homosexuality soon arise. "Gravity" puts Sandra Bullock and George Clooney in space. The premise almost sells itself. Meanwhile, Justin Timberlake and Ben Affleck bring their starpower to "Runner Runner," a thriller about online poker. "Captain Phillips" is based on the true story of the 2009 ship hijacking by Somali pirates. This is the kind of role Tom Hanks excels in. I just hope the movie focuses on more than just Phillips and the pirates – many other brave crew members were on that ship too. "Carrie" is a remake, and those don't particularly excite me – especially when the original needs no improvement. But with "Hugo's" Chloë Grace Moretz in the title role and the always great Julianne Moore as her mother, the casting is certainly rock solid. "Escape Plan" brings Sylvester Stallone and Arnold Schwarzenegger together for the first time (not counting Arnold's minor role in the "Expendables" movies). With Sly getting top billing over Arnie, it already feels off, because that isn't ever how they were ranked in the '80s action hierarchy. These dream team pairings are exciting on paper, but I've been burned too many times. And it may be a case of "too little, too late," but I'll remain cautiously optimistic for now. "The Counselor" is directed by Ridley Scott and written by Cormac McCarthy ("The Road," "No Country For Old Men"). That alone gives this project a boost in my mind. The fantastic cast doesn't hurt either: Brad Pitt, Michael Fassbender, Cameron Diaz, Penélope Cruz, and especially Javier Bardem. I like the idea behind "Bad Grandpa," which features Johnny Knoxville in old-age makeup portraying a grandfather seemingly tricking unsuspecting real people in Borat-style situations. Unfortunately, the trailer isn't very funny. Worse than that, it's offensive at times (crashing a funeral and knocking over the coffin – not funny). Still, this type of setup always has potential – and we've seen bad trailers for good movies many times before.